Born simply as Deepa on 26th January 1682 in village Pahuvind, district Tarn Taran, Baba Deep Singh ji grew up to be one of the most revered scholar, soldier and martyr of the Sikh faith. Baba ji’s parents Bhai Bhagata ji and Mata Jeoni ji, first took their son to visit Guru Gobind Singh ji at Anandpur Sahib in 1694 at the age of 12, where he served the community at Anandpur Sahib, learning Sikh philosophy as well as martial arts. On Vaisakhi day in 1700 that Deepa took Amrit from the Panj Pyare and was renamed Deep Singh. During his stay at Anandpur with many elevated souls, the Sangat recognised Deep Singh as a very wise man and therefore honoured him with the title of “Baba.” Baba Deep Singh later returned to Pahuvind to help his parents in 1702. It was in 1704 that Baba Deep Singh was informed that Guru Gobind Singh hi jad left Anandpur Sahib and that the two elder son’s of the Guru had been martyred in the Battle of Chamkor. Upon hearing such disheartening news, Baba Deep Singh Ji immediately left Pahuwind to meet with Guru Gobind Singh Ji. Baba Deep Singh Ji caught up with the Guru at Damdama Sahib in Talwandi. At Damdama Sahib, Baba Deep Singh ji worked with Bhai Mani Singh ji to prepare the final text of Guru Granth Sahib ji. Even after Guru ji had left Damdama Sahib to travel to Deccan with Bahadur Shah, and Bhai Mani Singh ji had been sent to Amritsar, Baba Deep Singh ji continued to write additional copies of Guru Granth Sahib ji including one in Arabic script, which was sent to the Middle East. In 1708 when Banda Singh Bahadur was authorised by Guru Gobind Singh ji to uproot the tyrant rulers in Punjab, Sikhs were ordered to support and join him in his mission. Baba Hardas Singh who had previously fought in Battles alongside Guru Gobind Singh ji led a jatha of Sikhs to join up with Baba Banda Singh Bahadur. Baba Hardas Singh (grandfather of Jassa Singh Ramgarhia) from village Sur-Singh district Amritsar, was a blacksmith who made many weapons including the Khanda (double edged sword) used by Baba Deep Singh ji and the Nagni used by Bhai Bachitter Singh ji against the drunken elephant at Anandpur Sahib. Baba Deep Singh ji joined the jatha led by Baba Hardas Singh and fought together in the battle under the command of Baba Banda Singh Bahadur at Sirhind—the city in which Guru Gobind Singh Ji’s younger sons had been killed. Baba Ji fought so bravely without care for his life, that Baba Banda Singh Ji Bahadur entrusted Baba Ji with the title “Jinda Shaheed” (living martyr). Since that moment Baba Ji was called “Shaheed Baba Deep Singh Ji”. It is noteworthy that Baba Ji wasn’t called “Shaheed” after he died, but during his own lifetime. As the leader of the Misl Shaheeda(n), Baba Deep Singh ji achieved numerous victories for the Sikhs. The Misl had its sphere of influence south of the River Sutlej and Baba Deep Singh’s headquarters remained at Damdama Sahib. The tower in which he lived still stands next to the Takht Sri Damdama Sahib and is known as Burj Baba Deep Singh Shaheed. In May 1757, on the orders of the Afghan ruler Ahmed Shah Abdali, the viceroy of Lahore Jahan Khan invaded Amritsar and razed the Sikh fortress of Ram Rauni and defiled the sacred pool. 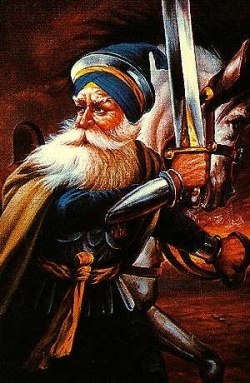 Although Baba Deep Singh Ji was now seventy-five years old, he still had the strength of a young warrior. He gathered a large group of Sikhs and advanced towards Amritsar. By the time they reached the village of Tarn Taran, about ten miles from Amritsar, their numbers had risen to about five thousand. At this time, Baba Ji drew a line on the ground with his Khanda, and asked only those who were willing to fight and die to cross the line. 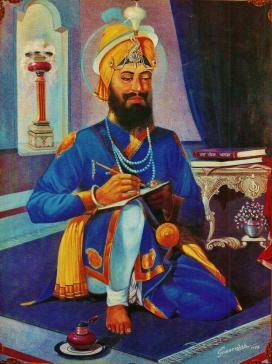 When news of Baba Deep Singh Ji’s intentions reached Jahan Khan, he immediately mobilized an army of 20,000 men and proceeded towards Tarn Taran. Baba Deep Singh Ji’s army intercepted Jahan Khan’s forces near the village of Goharwal, about five miles from Amritsar. Both the armies clashed near Gohalwarh on the 11th November, 1757. Fighting bravely, the Singhs pushed the army back and reached village Chabba where Attal Khan came forward and fierce battle ensued during which Attal Khan inflicted a blow on Baba Deep Singh Ji severing his head from his body. Baba Deep Singh, started to lose his footing under the impact of the blow, when a Sikh reminded him of his vow to reach Sri Harimander Sahib. Upon hearing this, Baba Deep Singh Ji immediately stood up, holding his severed head upright on his left palm while holding his khanda in his right hand. He then continued fighting (with strength derived from the recitation of prayers) and continued moving towards Sri Harimander Sahib. Upon seeing the sight of Baba Deep Singh’s headless body tearing through their numbers, most of the men in the Mughal army fled away in terror. Baba Deep Singh was able to continue fighting and fulfilled his oath on finally reached Sri Harimander Sahib – there he bowed and lay his head on the parkarma (rectangular walkway) of this sacred Gurdwara. The Sikh Army continued to fight the fleeing Mughals until victory was achieved. Baba Deep Singh ji is remembered by all Sikhs as a brave and courageous martyr with an unflinching dedication to the Sikh principles. Two shrines now commemorate the martyr, one on the circumambulatory terrace of the Sarovar surrounding the Harimander Sahib where he finally fell and the other, Shahidganj Baba Deep Singh Shahid, near Gurdwara Ramsar, where his body was cremated. The places where Baba ji drew the line, engaged in battle, lost his head, threw it, and where it landed are all marked by Gurdwaras in Punjab. Baba Deep Singh Ji’s actions encouraged the Sikhs to continue to fight against the tyrannical and oppressive Mughal Empire for many years. Even today, his life serves as an example for all Sikhs on how to live and die with dignity. Guru Gobind Singh Ji’s art of warfare was swift manoeuvres against relatively larger forces to achieve complete surprise over the enemy. Critical analysis of his battle with Hussain Khan of the allied forces at the battle of Nadaun amply illustrate that the manoeuvres were not aimed to slaughter the enemy but to cause fear and panic in the enemy ranks in order to disorganise and thereby drive them from the battle field. The fleeing enemy were never given pursuit by the Khalsa army as that would have amounted to indiscriminate killing of men and therefore against the Khalsa code of conduct. Guru Ji’s action on the battlefield repeatedly shows quick decision, rapid cavalry manoeuvres and flexibility of mind. Incidentally these three characteristics – quick decision, rapid manoeuvres and flexibility in an ever changing situation rank the most prominent ones in modern warfare. The element of battlefield mobility, inherent in mounted weapons on horses, camels and elephants were employed in offensive roles both in nature and concept even as a defender. A careful analysis of Guru Ji’s battles indicates that Guru Gobind Singh Ji never risked the security of the main defences in a bid to achieve mere surprise. Thinning out the main defences for creating various combat groups, aimed to hit the enemies rear and exposed flanks were well balanced and at no time were the main defences rendered insecure. Resources, both in men and material, available to his command, although meagre compared to those of his adversaries, were always utilised to maximum advantage. Needless to emphasise that leadership ability is measured by the degree of effectiveness with which each leader employs those assets available to him. Basic principles of objective, offensive, simplicity, unity of command, economy of force, surprise and security, morale, manoeuvrability, flexibility and so forth were always integral ingredients in Guru Ji’s plans. As a general in the battlefield Guru Ji succeeded in forcing his adversaries to give up their purpose completely. After the battle at Mukatsar, the Mughals realised the futility of their efforts and were so badly demoralised that they gave up altogether. Hostility towards the Khalsa army vanished never to resurface again while Guru ji was alive. Guru Gobind Singh Ji as a general never once remained away from the battlefield giving a pretext of directing the operation. Guru ji always directed and fought at the same time with the forward most rank and file of the Khalsa army. Despite mental and physical stress of day long battles, Guru Ji attended to minor details. After day long battles Guru Sahib Ji personally attended to the wounded and solemnised last rites who had touched martyrdom as his command. The discipline of Guru ji’s army was not based upon fear or punishment but on mental awareness and realisation of their moral and patriotic duty which always exhorted the Khalsa soldier to stand at the beck and call of their leader with a will to do or die. The victories of Guru Gobind Singh Ji can be attributed to discipline of his troops which impelled them to strictly observe the demands of the oath of allegiance and self devotion to their Guru. Guru Ji’s army strictly observed the Khalsa Code as given by their Guru. 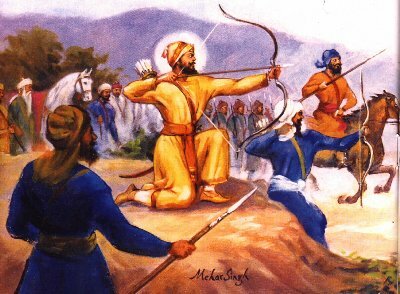 There were numerous occasions when the Khalsa army, after victory in the battle field, could have wiped out the enemy by pursuing them, but did not resort to it as it was not approved by their leader. It speaks of excellent self control realised through a very high standard of discipline. With Bahadhur Shahs succession to the Moghul throne, Guru Gobind Singh Ji’s military life came to a virtual end, but an epic legend in the military profession had only sprung to grow till eternity. Much of Baba Moti Ram Ji Mehra’s life is unclear and until recently much was not known. Baba Moti Ram Ji Mehra was born in Fatehgarh Sahib (the year is unknown but many Historians claim approx 1660’s). Baba Moti Ram was one of two sons. His elder brother was Baba Joti Ram who was the father of Bhai Himmat Singh Ji, one of the original Panj Pyare (five beloved ones). 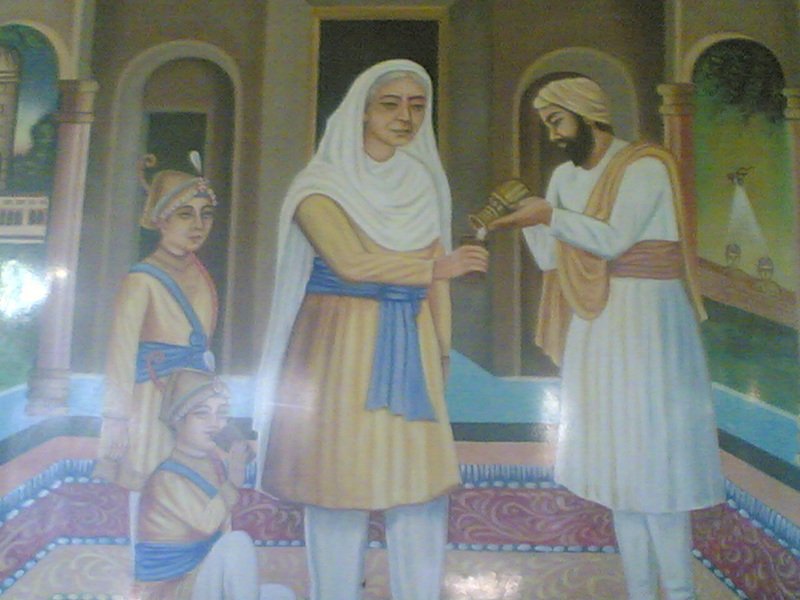 On the 24th December, 1704, Sahibzadas Baba Zorawar Singh ji, Baba Fateh Singh ji along with Mata Gujri ji (mother of Guru Gobind Singh Ji) were arrested by Kotwal Jaani Khan of Morinda at Kheri, the native village of Gangu Ram. Gangu was a servant of Guru Gobind Singh who was allured by the money and jewellery which Mata Gujri ji carried and ,thus, informed the Kotwal of Morinda about their presence in his house. Jaani Khan brought them as prisoners to Sirhind. Faujdar Wazir Khan of Sirhind imprisoned them in the Thanda Burj (cold Fort). Baba Moti Ram Mehra was a servant in the Hindu kitchen of the Faujdar. He used to serve food to the Hindu prisoners. Jagat Mata Gujri ji refused to accept the food of the Mughal kitchen as well as that which came from Diwan Sucha Nand’s house. Baba Moti Ram Mehra was a great follower of Sikh Gurus. He used to serve the sikhs on their way to Ananadpur Sahib and back to their homes. The Sikhs took rest at his mud house, where the mother of Baba Moti Ram Mehra and Bibi Bholi, wife of Mehra ji prepared food for these sikhs. When Jagat Mata Gujriji refused to accept the food, Baba Moti Ram Mehra could not bear the Sahibzadas sleeping hungry. He came home and told his family that he would serve milk and fresh water to these great prisoners. 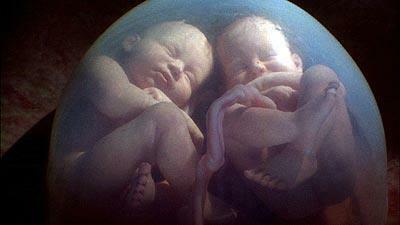 His mother and wife wee scared and tried to persuade him not to take such a step. Bibi Bholi, wife of Mehra ji, told him that the Wazir Khan had made an announcement in the town that whoever tried to help and serve any type of food to the sons of the tenth Guru, he along with his family would be crushed alive in a Kohlu, (the oil squeezer). This information could not change the resolve of Baba ji. His mother told him that there were so many followers of the Guru in the town, they could have dared to serve the Sahibzadas. Baba Moti Ram Mehra humbly, but with determination, told his mother that those followers feared the ruler . On 27th December 1704, the Sahibzadas were slain after bricking them alive in the foundation of the wall. Mata Gujri ji also breathed her last. Raja Todar Mall of Sirhind performed the cremation. He told Baba Mehra ji to arrange a cart of Chandan wood, which he brought from the forests of Atta Ali. After some time, Pumma, the brother of Gangu, told the Faujdar that his servant (Cook) had served the prisoners with milk and water. Baba Moti Ram Mehra, his mother, wife and a little son were arrested. He did not conceal his act and boldly told the Faujdar that, it was his dharma to serve the young children and the aged mother of Guru Gobind Singhji. So, Baba Moti Ram Mehra along with his family were sentenced to the death by being squeezed in a squeezer (Kohlu). Today a Gurudwara stands in memory of Baba Moti Ram ji Mehra and their family in Sri Fatehgarh Sahib. 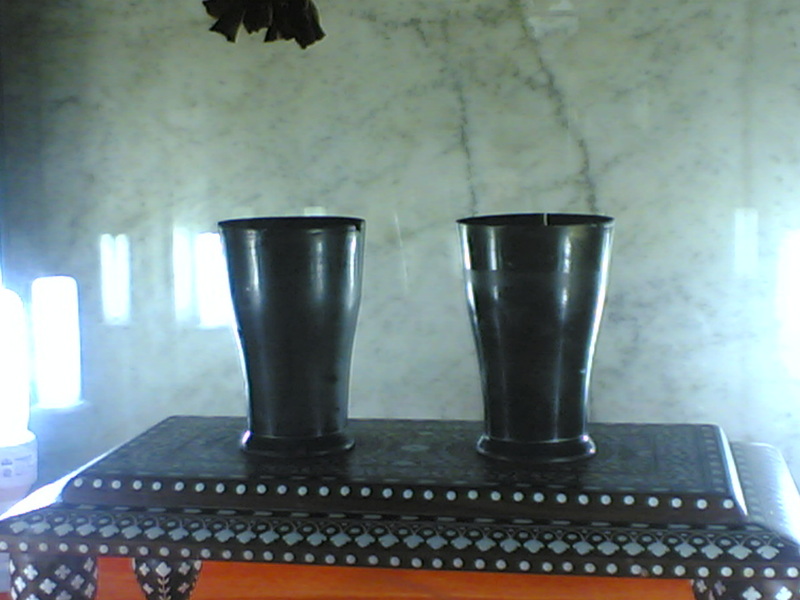 Below is an actual picture of the 2 steel glasses which were uses by Baba moti Ram ji Mehra to serve the milk to the Chotte Sahibzade and Mata Gujri ji.